Empowerment is a process of awareness that is about activating people to use their own strengths. It’s a self-awareness tool. This article describes empowerment in a practical way. After reading you will understand the definition and basics of this powerful leadership and management concept. Each organisation is driven by its employees. That means it’s important to motivate all employees and raise them to a higher level. Empowerment aims at making employees function as optimally as possible by giving them independence. American psychiatrist Judi Chamberlin wrote an article about empowerment in 1998. With regard to organisations however, empowerment is different from delegating. It’s about motivating personnel to make them more powerful, enabling them to get even more quality out of their activities. This will improve overall productivity and increase mutual trust, engagement and loyalty of the employees, all while giving them the chance to develop. Empowerment is a process of awareness that is about activating people to use their own strengths. It’s a self-awareness tool. An important aspect of empowerment is management development, which focuses on correctly filling internal vacancies. It encourages employees to learn on the job. That guides them to independence, to perform better and to find solutions together. Their experience enables them to grow and support other co-workers. Empowerment is a management tool that employers use to enable employees to develop themselves. On the one hand, it focuses on discovering and employing the talents of employees. On the other hand, it focuses on stimulating employees to grow. Every position within an organisation requires specific competencies. Empowerment is about bringing the talents of different employees to the surface and using that talent at different departments. This will increase employee performance. It is important that organisations are aware that they have to support their employees in this respect and encourage them to develop themselves. Empowerment has many benefits. Both for the individual employee and the manager as well as the organisation as a whole. Employees who are empowered understand that they have the ability to change their attitude. They control it. They are confident and approach others feeling good and relaxed, regardless of whether they’re a co-worker or a superior. They believe in themselves and won’t let others around them intimidate or discourage them. Empowered employees believe in equality and won’t allow others or themselves to show dominance. As employees, they have excellent problem-solving skills; they’re willing to take risks and try to arrive at a workable solution step by step. They are also able to come to good and clear agreements and actually honour these. Furthermore, empowerment increases a manager’s scope of control. They won’t have to worry about their employees as much nor give them as much guidance, as they are perfectly able to work independently and to take responsibility. Empowerment believes in people’s personal strength that allows them to take control of their own lives. 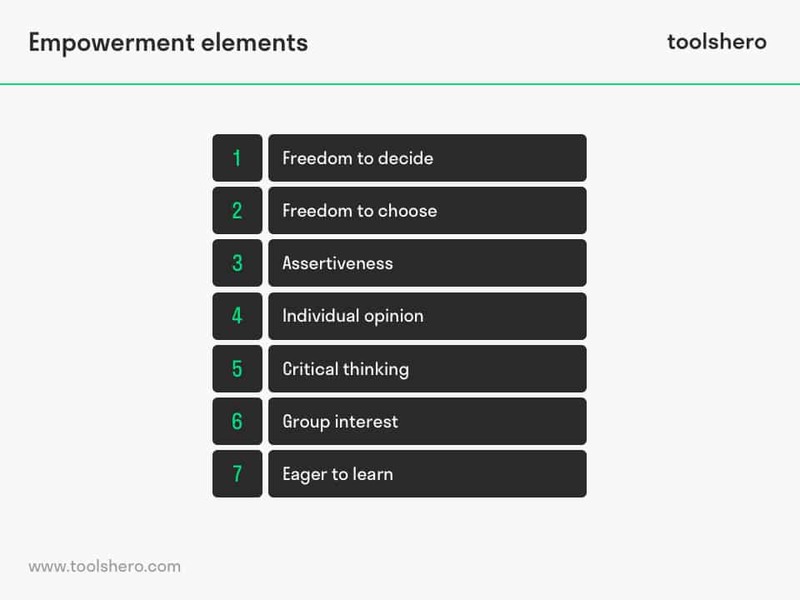 According to Chamberlin, Empowerment is composed of various elements. We’ve made a list of the most important ones that primarily apply to employees. It gives employees a lot of independence when they’re allowed to make their own decisions, for instance about the tasks they perform and the time in which something has to be completed. It makes them better able to keep their promises, and they experience more joy in their work. This also grants independence, and it’s worth noting that it can even help employees make the right choice. Continuing to be of two minds is not part of freedom to choose; it’s about going for it. By clearly standing up for themselves while also respecting others and expressing their own wishes and expectations, employees will be able to achieve what they want. Empowerment enables employees to express their opinions and to really listen to others. By acting in ways that are not conditioned and instead also looking at things from different perspectives, employees are more aware of their own actions and those of others. Empowerment isn’t just about the individual; it’s also about being connected with others. This is a particularly important aspect in a team context. Without being open to new methods, approaches and ideas, an individual can’t grow. Empowerment is mainly achieved by giving employees the opportunity to improve themselves with challenges, training or expanding their responsibilities. By frequently holding individual meetings with all employees, an organisation can learn about their needs and wishes. Everything that has been agreed can be recorded in a Personal Development Plan—the so-called PDP. It’s important that the manager acts as a coach in this respect. When the manager adds any pressure from above, empowerment becomes impossible. The idea is that the meetings take place as equals, giving the employee the initiative. They will have to put forward ideas to increase their knowledge and skills. That’s the only way in which they’ll be motivated enough to take the plunge and work towards the final goal. The manager monitors, stimulates and motivates that journey. What do you think? Do you recognize the practical explanation or do you have more additions? Is empowerment something that is applied within your organisation? What are your experiences with empowerment?